Architecture graduate Manuel Domínguez has proposed a conceptual design for a moving city. The project titled ‘Very Large Structure’ spans a length of 560 metres and is made up of three levels. • Lower layer would function as a construction/warehouse area. • Top layer would be the actual living deck. 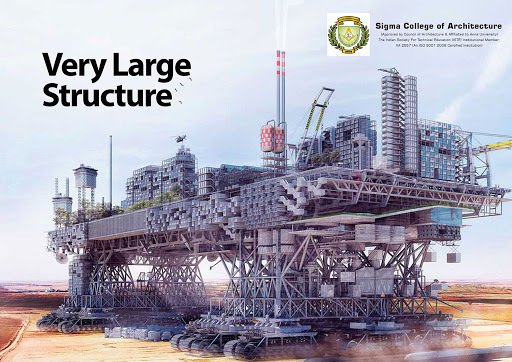 The entire structure would be based on a giant gantry crane and a total of 36 oversized crawlers are installed so as to would allow it to move. These crawlers are propelled by the same electric engines that are used in large sea vessels. The designer claims that the project can very easily become a reality as it is built on preexisting systems and technologies that are made use and readily available. “VLS is a theoretical utopian project trying to be as realistic as it can get, and even though everything is technically calculated as if it was going to be constructed, I perfectly know and assume it's just an assertive investigation” said Domínguez.